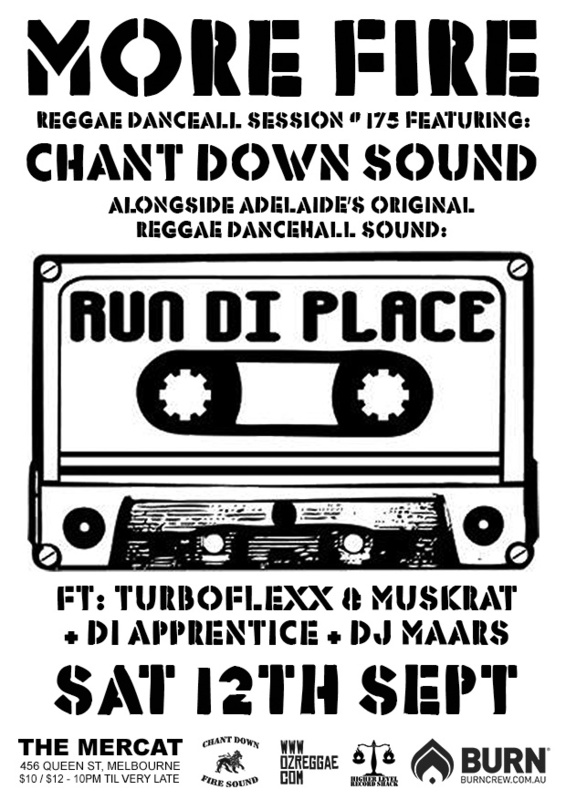 More Fire residents Jesse I and Ras Crucial will be joined by very special guests in September, as Adelaide’s premier reggae dancehall clique “Run Di Place” come to blaze it up down in Deep 11. Pioneers of the Adelaide club scene, selectors Turboflexx and Muskrat have been representing for Jamaican music since the mid 90s. Recent years have seen their “Strictly Dancehall” parties putting Adelaide back on the musical map, while their monthly mix-up CD series has taken their name worldwide. Join RDP at More Fire in September as they go back-to-back with resident sound Chant Down; plus support from DJ Maars, and a guest performance by Di Apprentice. Up! More Fire # 175 takes place on Saturday 12th September at Deep 11 (Mercat Cross Hotel basement, 456 Queen St, Melbourne). Doors open at 10pm, with a cover of $12 or $10 for concession holders, and PBS FM members.